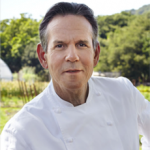 Renowned for his culinary skills and impeccable standards, Chef Thomas Keller is the chef and proprietor of The French Laundry, a Yountville, California landmark that has been hailed as the finest restaurant in the world. Ten years after opening The French Laundry in 1994, he launched Per Se, bringing his distinctive fine dining style to Manhattan. Today, both restaurants enjoy three-star Michelin ratings, making Keller the first and only American-born chef to hold multiple three-star ratings from the prestigious dining guide. Chef Keller has also opened Bouchon, Bar Bouchon, Bouchon Bakery, and Ad Hoc, each of which contributes to the new paradigm he has set within the hospitality industry. More than one million copies of Chef Keller's books are in print, including the New York Times best sellers “Ad Hoc at Home,” "Bouchon Bakery," "The French Laundry," “Bouchon" and “Under Pressure,” a book devoted to sous vide cooking. Keller was designated a Chevalier of The French Legion of Honor in 2011, the highest decoration in France, in recognition of his lifelong commitment to the traditions of French cuisine and his role in elevating cooking in America. He is only the third American culinary figure to be so honored. Chef Daniel Boulud, a native of Lyon, France, is considered one of America’s leading culinary authorities and one of the most revered French chefs in New York, his home since 1982. 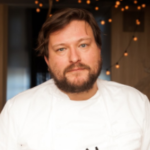 Daniel is the chef and owner of 13 restaurants around the world, and is best known for his eponymous, exquisitely refined DANIEL on Manhattan’s Upper East Side. Outside of New York, Chef Boulud’s cooking can be found in London, Singapore, Toronto, Montréal, Miami, Palm Beach, Washington DC and Boston. 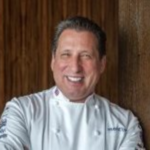 Boulud is the author of nine cookbooks, the recipient of multiple James Beard Foundation awards, including “Outstanding Chef” and “Outstanding Restaurateur,” as well as The Culinary Institute of America’s “Chef of the Year Award” (2011) and The World’s 50 Best Restaurants “Lifetime Achievement Award” (2015). 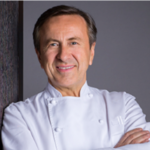 Boulud was named a Chevalier de la Légion d'honneur by the French government in March 2006 in recognition of his contributions to the advancement of French culture. He has been a generous supporter and co-president of Citymeals-on-Wheels for more than two decades, and is Chairman of the ment’or BKB foundation. How significant was it for the USA to win the Gold at the Bocuse d'Or? I am not sure I can quantify that in a sentence or a paragraph, as it has been something the USA has been working towards for the past 30 years since the competition was created. We not only achieved the goal we set out for, but we did it as a foundation that has set itself up with the highest of standards, while pursuing culinary excellence on a daily basis. It did not happen over night, it took us 10 years to get the right team together, and after many lessons learned, history was made. How is training someone for the Bocuse d'Or different than training someone to work in the kitchen? The Bocuse d’Or demands focus and dedication that no other type of cooking in the kitchen demands. You are training for a year for 5 hours of cooking, you are perfecting what may already be perfect, you are tasting what may already be delicious, but you are never satisfied, not until you stand on that podium and raise the trophy, then and only then was it all worth it. Unlike a kitchen, there is nothing instant about the Bocuse d’Or, it is the journey that you need to embrace and thrive off of. What is your favorite part of training or what aspect of training inspires you? When we do a tasting, I am always inspired, not only by what the chef presents but how we are all able to speak the same language on that garnish and talk about it for hours. It may only be a piece of asparagus, as an example, but how do you make it better then every other piece you have ever had? Those conversations inspire me to pursue what we do on a daily basis in my kitchens. When did you first learn about the Bocuse d’Or and what were your first impressions? I have long been a fan of the Bocuse d'Or. I was first introduced to the competition by my mentor and former chef, Robert Sulatycky, when I worked for him in Chicago in 2003. He had competed for Canada in '99 and was active in Canada's national team. I was lucky to travel with Team Canada to Lyon for the '07 competition and see the competition first hand. I have been passionate about the competition ever since, and I'm very honored to play but a small part for my home country. What inspired you to be a part of Team USA 2017 and what was your involvement? Before 2015, our country had long been relegated to the second tier of competitors of the Bocuse d’Or. I believe that our nation’s current culinary endeavors are of equal standing with any other nation’s culinary endeavors, and I believe it to be critical to our country’s culinary community to represent ourselves accordingly at the Bocuse d’Or. For the 2017 team, I filled the role of Assistant Coach. I was lucky to engage with the team in an ancillary role of support and input. You were there to witness Team USA 2017 win Gold for the first time ever, what did you take away from that historic moment? As a spectator at the ’07,’15, and '17 Bocuse d'Or, I have personally seen the results of the tremendous efforts of Team USA over the last decade to improve our standings as an international contender. Standing in a crowd of thousands from all over the globe as the results were called, it was a deeply moving moment when the late Joel Robuchon announced that the US had won gold. I felt proud to be an American chef. Now we owe it to ourselves and to the country we represent to continue to be at the top of the pack in future years. I first learned about the Bocuse d’or during my stage with Team USA 2017 after I won the Ment’or Commis Competition in 2016. I was very impressed watching the team work and was honored to be part of the team and to help out with anything they needed. I thought being a part of the team would be a great opportunity. I learned a lot about the Bocuse d’Or during my stage with Team USA and what it was that draws everyone to it. During my stage I helped the team out with prep, family meals, and also being a commis for the practice runs. And as seen in pictures of the finished plates by the Team, I helped Crucial Detail fold the cloches that were used in the competition. It was an honor and such an amazing experience to be a part of the team, and when they won gold for the first time it was such a special and surreal moment that it made me want to participate in the Bocuse d’Or also. I was at the appropriate age and this would be my only chance to represent Team USA as a Commis if chosen. 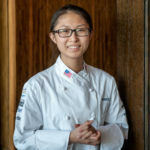 To learn more about Commis Mimi Chen, click here. How has your experience with the Bocuse d’Or, from competing to being on the international jury, influenced your coaching? It was an eye (and tastebud) opening experience to sit on the international jury. Finishing fourth in 1999, I always wondered what the difference was between say, first place and third, or second and fourth. It finally came full circle and made sense when I judged. It was down to the simplest of things, perfect seasoning, perfect doneness on the fish or meat and the food being warm. These sound like very easy steps to achieve in the workplace kitchen on an everyday basis. However, in the hyper stressful and extreme pressure environment of the Bocuse d’Or, in a kitchen space that is not familiar, with fans making deafening noise, these simple things can be quite elusive. It was these simple things that made the difference between the top six countries. As a coach now, I focus and stress the importance making sure the basics and the simplest of tasks are perfect. Perfection is just a lot of little things done well. I hone in on all of these little things, knowing that if we get them all right, then we’ll have the best tasting food, and that’s what wins. When did you learn about the Bocuse d'Or, and what were your first impressions? I first learned about it in 2015 while following Chef Tessier via social media. I quickly realized how prestigious the competition is, and I was immediately intrigued by it. What influenced your decision to become involved with Team USA 2019? 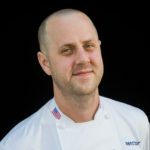 I worked with Chef Matt Kirkley during a short stint at Coi before he officially took over the Team USA 2019 kitchen. We stayed in touch and then I randomly ran into him. He told me about what he was working on and said that he would be happy to bring me on board if I was interested in joining the team. The next day, I gave my notice at the restaurant where I had been working at the time. What do you hope to get out of this experience of training with Team USA? It is exciting to be a part of something that is much larger than yourself. I have a tremendous amount of respect for Chef Kirkley. I always knew that at some point in my career I would work for him, and I figured there would never be a better time. I have really been enjoying working closely with the ingredients that we have been trying out during our menu development stages, and I will never be in an atmosphere that is more organized than Chef Kirkley’s kitchen. 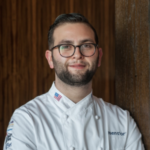 To learn more about Chef Jordan Guevara, click here. I learned about the Bocuse d’Or when I was in culinary school. I never thought I would be in a position to actually participate in it and represent America one day. It is a competition that I have always regarded highly. I have been working for Chef Kirkley for a long time, and even though I am a pastry chef, I have been very influenced by his cooking. He is a very technique-driven chef, which I believe makes him a perfect fit for the Bocuse d’Or team. Why is it important for young chefs to know about the Bocuse d’Or? It’s important for young chefs to know about the Bocuse d’Or because it is the highest form of cooking for a chef. It is challenging creatively, mentally, and physically. It is a cooking competition that pushes the boundaries of what food can be now and the future. It is the definitive benchmark for food from a specific time and place. 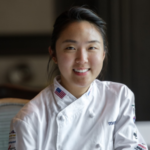 To learn more about Chef Alice Kim, click here. 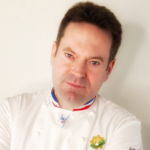 As a French chef, I have known about the Bocuse d’Or since the start of my career because the competition is held in France and it is very highly regarded there. I have also always worked in prestigious environments where that type of competition is valued. I once participated in a prestigious competition myself. I appreciate how determined Team USA is, and I admire the fact that they are very skilled and hard-working individuals. The Bocuse d’Or can help to inspire, motivate and push the up-and-coming generation of chefs to work harder and strive for excellence. The prestigious recognition they can gain through the competition has the potential to change their lives. To learn more about Chef Claude Le Tohic, click here. I first learned about the Bocuse d’Or while watching the Food Network with my dad when I was a kid. I was never that big on competitions, but I remember being in awe as I watched the chefs performing their craft at the highest level possible. When Chef Kirkley asked me to be one of the coaches, I was immediately interested. He is one of the most technically-gifted chefs in the country. To be able to work with him in this capacity is an invaluable experience. I think the Bocuse d’Or teaches young chefs to respect tradition, which includes both discipline and technique. These days, it often falls by the wayside. 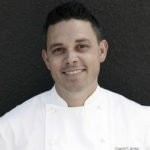 To learn more about Chef Erik Anderson, click here. Kastner, born in the Czech Republic, trained as a blacksmith and spent some time restoring historical metalworks at a castle in Western Bohemia before moving on to natural materials design and sculpture. He founded Crucial Detail in 1998, shortly after his arrival in the United States. 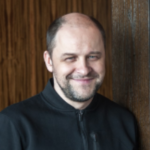 He is best known for his Alinea serviceware concepts, which landed him on The Future Laboratory's “100 Most Influential Individuals in Contemporary Design” list. Kastner is also the designer behind The Porthole infuser, a beautiful infusion vessel that was originally created as one of many custom pieces for bar chefs at The Aviary in Chicago. The Porthole has been featured in dozens of publications, including on the cover of Food Arts Magazine. It is used in some of the world's most prestigious bars, hotels and restaurants, and it is sold in the Museum of Modern Art store in New York City. Kastner received the 2014 IHHA Global Innovation Award for Best Product Design, and he designed the platter and tools used by Team USA in the 2015 and 2017 Bocuse d’Or competitions that contributed to their first-ever silver (2015) and gold (2017) wins.